Margaret Tudor’s life was in many respects as contrary and tempestuous as that of her granddaughter, Mary queen of Scots. Certainly the parallels between their second marriages are the most obvious and entertaining. Both women married handsome younger earls with powerful fathers who embroiled them in conflict with the notoriously fractious Scottish lords and the English monarch. And though both women married those earls for love, without regard for any effect upon their rule and reputation, they came to bitterly regret their hasty decisions. They also entered Scotland as foreigners who found their new home backward and unsettling. Margaret was the eldest daughter of Henry VII of England and Elizabeth of York, born on 28 November 1489 at the Palace of Westminster, a year and a half before her famous brother, Henry VIII. The elaborate and costly preparations for her birth were recorded by contemporary chroniclers; Elizabeth of York had officially retired from court life in October 1489 and, when labor began, the queen was accompanied by the earls of Oxford and Derby to Mass. Afterwards she entered the state bedchamber where she presided over a meal of spiced wines and sweet cakes. The queen’s chamberlain then asked all present to pray for a successful labor. The noblemen then left and Elizabeth, attended by twenty ladies and their various attendants, entered the inner chamber where she would actually give birth. Her bed was a magnificent creation with a gold canopy and embroidered red roses for her husband’s house of Lancaster. At nine o’clock that night Princess Margaret Tudor was born. She was christened by John Morton, the archbishop of Canterbury, at the chapel in Westminster two days later; her godparents were her grandmother Lady Margaret Beaufort for whom she was named, the duchess of Norfolk, Lady Berkeley and the earl of Shrewsbury. After the celebrations, she was returned to her room where four nurses (her two head nurses were Alice Davy and Alice Bywimble) and six rockers, along with their various attendants, waited to serve their new charge. Her first year was spent mostly in an oak cradle lined with ermine and draped in cloth of gold, an ornate setting to which she became accustomed and sorely missed later in life. As the first Tudor princess, Margaret was immediately placed on the European marriage market since Henry VII was eager to strengthen foreign support for his new dynasty. She spent her first fourteen years in England and was imbued with a self-righteous belief that England was meant to control Scotland, if not subjugate it entirely, and that Tudor rule was as valid as any other European dynasty. Despite the general view that the Tudors were upstarts and her father’s claim to the throne was rather dubious, Margaret embraced her royal title and lineage with passion. The atmosphere of those early years in England was still medieval, and she lived in Gothic palaces with ornate decoration and rituals. All of Henry VII’s children came to participate publicly in court life while still children. Before the age of five, Margaret attended court ceremonies and played her part with aplomb. She had an early love of pomp and pageantry which was never lost, and her father’s court was rather extravagant considering Henry’s reputation as a shabby miser. As a child, Margaret shared a household with her older brother, Prince Arthur. Born on 20 September 1486, barely nine months after his parents’ marriage, Arthur was the hope and joy of the Tudors. He and Margaret traveled with their own households from Eltham to Westminster to Windsor and back again, visiting their parents as often as possible. Their education was guided by their formidable grandmother, Lady Margaret Beaufort, who was a shining example of female piety and learning. Lady Beaufort’s impact upon Margaret ensured her a thorough education but Margaret never shared her grandmother’s love of scholarship. Henry VII was a busy and oft-distracted king whose reign was a constant struggle in the early years of Margaret’s life; he loved his daughter, but had little time for any of his children. Her mother, Elizabeth of York, was a quiet and gentle woman whose motto ‘Humble and Reverent’ aptly summarized her way of life. She was a loving mother but spent most of her marriage either pregnant or recovering from increasingly difficult births. Her ill health often forced her into confinement and her role at court functions was filled by her mother-in-law. Margaret reveled in court life and enjoyed her position as princess to the full; she began a lifelong love affair with beautiful clothes, delighted in dancing and music as well as archery and playing cards. She had no responsibilities other than to fulfill her public duties as princess and, as a result of her privileged position, developed a very stubborn personality. It was Margaret’s lot to be impatient and disappointed when things did not go her way. In this, however, she can be forgiven; most royal children were equally stubborn and certainly the two siblings who survived childhood with her shared this trait. It is worth remembering, too, that her acute awareness of her position included the knowledge that she would one day leave England, perhaps forever. It was not the fate of princesses to live and die in their own countries. But as Margaret’s later actions make clear, those early years in England left an indelible mark upon her; she always put English interests first, even when it was not the sensible thing to do. Her fifth birthday coincided with Henry’s elevation to the dukedom of York in 1494. There was a grand celebratory tournament in Westminster which lasted three days and the appearance of the ‘right high and excellent Princess, the Lady Margaret’ was recorded for posterity. She wore a gown of buckram and velvet trimmed in gold lace with a winged white cap, an unflattering but popular style from the Low Countries. Her best features were her clear complexion and fair hair, both inherited from her mother. But her temperament was that of her maternal grandfather, Edward IV, a trait she shared with her brother Henry. While Prince Arthur was a reserved and thoughtful boy dedicated to scholarship, Margaret and Henry were gregarious and energetic. They danced at the tournament, to the amusement of the adults, and Margaret presented the prizes to the jousters. Traveling with a great retinue from one palace to another, she was hardly aware of the struggles her father faced; plague, rebellion, and war marked Henry’s years on the throne as he constantly struggled to fill his treasury and placate his people. 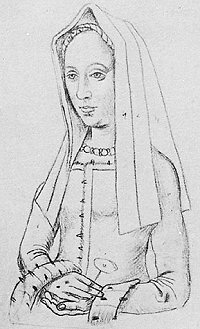 One of the more serious struggles led to Margaret’s betrothal in 1496 to James IV, king of Scotland. Henry wanted an alliance with Scotland for two pressing reasons. First, James was following the old Scottish tradition of angering the English by supporting Perkin Warbeck, a pretender to the English throne who claimed to be Prince Richard of York. This debacle lasted from 1491 to 1497, but was made more pressing by Prince Arthur’s engagement to Princess Katharine of Aragon, the daughter of Ferdinand and Isabella of Spain. At the time, only Spain recognized Henry’s rule and he was desperate to secure a marriage alliance between the two countries. But the Spanish would not send Katharine to England unless Henry was secure on the throne and their daughter could arrive safely and peacefully in England. In 1493, they brokered an agreement between Scotland and England which ended Scottish support of Warbeck and gave hope for a more comprehensive peace in the future. Second, Scotland had long been allied with France in what was termed the ‘Auld Alliance’, essentially the partnership of two English enemies. French money and troops had often threatened the English-Scots border and Henry was desperate to avoid further unrest. He and his councilors thought a marriage between James and Margaret would create a bond between England and Scotland which would allow England some desperately needed peace and tranquility. James IV of Scotland was amenable to the idea as well. He was sixteen years older than Margaret, but such differences in age were common enough in royal marriages. For the security of his own realm, as well as an impressive dowry, he was content to marry Margaret. James’s own life had been tempestuous and unhappy. 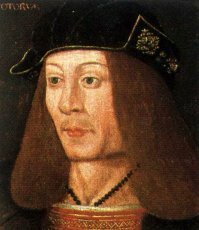 Born on 17 March 1473, he was barely sixteen years old when disaffected Scottish lords led by the Humes and Hepburns forced him to ride in battle against his own father, James III. At the climactic battle of Sauchieburn in the summer of 1488, James III was murdered by a man pretending to be a priest and his son was crowned king of Scotland. James IV was traumatized by his role in his father’s death; for the rest of his life he wore an iron chain around his waist as penance and made frequent pilgrimages to the shrine of his patron St Ninian. His personality was both charismatic and melancholy and he was quite brilliant. His varied interests included dentistry, golf, and hunting; he was also very energetic, and exhausted his nobles with his ceaseless traveling across his kingdom. He was quite dedicated to the ideal of the chivalrous knight and admired the tales of King Arthur. This romantic notion led him to numerous love affairs (by the time of his betrothal to Margaret, he already had five healthy illegitimate children) and a lifelong desire to lead a Crusade. His people loved him and his court attracted a number of brilliant poets, including William Dunbar, Gavin Douglas and David Lindsay. Also, Scotland had three universities while England had only two, a fact which few historians have noted when dismissing any evidence of Scottish learning in the late 15th century. But the country remained fractious and dangerous, largely because of its squabbling nobility. Certainly James’s reign was marked by increased prosperity and the flowering of the arts, but he could not subdue the clans or even intimidate them much. And the lesson of his father’s reign haunted him as he attempted to provide some order and stability for his people. He was more successful at this than most Scottish kings, but not successful enough. In Scotland, the nobles controlled far more land than the king and were savage opponents of royal authority. The burgeoning middle class was terrified of warfare and also susceptible to English bribes. Shifting loyalties and simmering resentment marked relations between the king and his nobles. Poor James did not have an easy life as king. But his prolific romantic life was legendarily successful. James cut quite a swath through the common and noble women of Scotland, eventually losing his heart to Lady Margaret Drummond. James had earlier attempted to marry a Spanish princess himself (much as Henry VII secured a Spanish bride for Prince Arthur) but, when that failed, his love for Margaret Drummond was such that he seriously considered marrying her. His councilors were understandably aghast; any marriage to a subject would necessarily elevate that subject’s family to pre-eminence in the realm. They would not allow it and did their utmost to persuade James to reconsider. The king began negotiations for Margaret Tudor’s hand even as Margaret Drummond gave birth to their daughter. James moved mother and child to his palace of Linlithgow and showed them every favor. Rumors of a secret marriage between the two were rampant but the Scots successfully concluded the marriage treaty with Henry VII. Still, James’s ministers were concerned that Henry VII would learn of Margaret Drummond and it might complicate relations. But the problem was solved when Margaret Drummond and her two sisters were poisoned in spring 1502. The king was devastated. No one was arrested for the crime, for which most of his councilors were secretly grateful. James almost immediately began another affair with Lady Janet Kennedy, but his grief for Margaret Drummond did not lessen. She was the great love of his life and he never forgot her. But Margaret Drummond’s death freed him to openly plan his marriage to Margaret Tudor, who until then had been merely a bargaining chip with the English. James was determined that his marriage would restore Scottish pride which had suffered much from English harassment along its borders. He ordered a grand trousseau from Paris, as well as presents for Margaret and new clothing for his courtiers. His own clothes included several pairs of scarlet hose, robes of black velvet trimmed in fur, a crimson jacket lined with cloth of gold, and a truly grand wedding outfit of white damask embroidered with silver and gold thread. To Margaret he sent a gown worth almost 160 pds and his courtiers received sumptuous clothes and jewelry. His spending grew so extravagant that he was forced to acknowledge his penury to Henry VII; the English king had written to find out the salaries of Margaret’s ladies-in-waiting who would accompany her to Scotland. James was forced to prevaricate on that matter, replying only that they would receive ‘competent fees’. In England, meanwhile, preparations for Katharine of Aragon’s marriage to Prince Arthur consumed far more time and energy than Margaret’s betrothal. The Spanish princess was married to the Tudor heir in the autumn of 1501 and Margaret attended the wedding feast at Westminster Hall; she wore a gown of crimson velvet trimmed in fur and sat, along with Prince Henry, on a wooden stool covered with scarlet cloth beside their parents. Prince Henry had apparently flown into a rage when told that his sister would soon be known as queen of Scots and thus accorded precedence over him in public ceremonies. This essentially meant that Margaret would be announced before him at court functions, a relatively trivial matter, but observers noted the young prince’s love of his own high position. The tantrum resolved itself and Henry was on perfect behavior during the wedding festivities which followed. The earl of Bothwell, the bishop of Moray, and the archbishop of Glasgow were sent as ambassadors from Scotland. They were also present at Westminster during those celebratory days, under orders to observe Margaret and report on her appearance and behavior. If they found it ‘most convenient and advisable’ they were to marry her at once by proxy. Many of the intricacies of the marriage negotiation had already been decided upon and Pope Alexander VI had given the necessary dispensation, though he advised Margaret to remain in England for another year so she would be ready for child-bearing upon her arrival in Scotland. The matter of dower lands was soon settled as well. James was to be responsible for ‘the apparatus of her body, the ornamenting of her residences, her vehicles, stud, furniture, dress, private and domestic affairs, and all other things whatsoever necessary and becoming the honour, state and dignity of the said Lady Margaret.’ Margaret’s dowry was 30,000 gold nobles to be paid over three years. The king then led the Scots to his rooms while Elizabeth of York took Margaret’s hand and led her to the royal dais. The mother and daughter sat side by side now, equal in title and precedence. The next few days were spent in celebratory tournaments and banquets at Westminster Hall, all of which had Margaret’s participation. And yet, just as it seemed that Henry VII’s most fervent ambitions were being realized, news soon arrived from Wales that Arthur and his bride had fallen ill. The young prince died while his new bride recovered. Henry and Elizabeth were devastated; accounts of their grief can be read at the Primary Sources section. The court was thrown into mourning and a few weeks after the death Elizabeth of York became pregnant yet again. It did not help her delicate health. A son was born prematurely and christened Edward, but died soon after. The queen’s strength never recovered and, upon yet another stillbirth on 2 February 1503, she became deathly ill. She died on 11 February 1503, her thirty-seventh birthday, having given birth nine times and leaving three surviving children. An account of Elizabeth’s death, which coincided with Margaret’s departure for Scotland, can also be read at Primary Sources. Margaret’s feelings on her brother’s death and mother’s ill health are not recorded. She was obviously closer in temperament to Henry, but also she was consumed with preparations for her departure to Scotland. And for a young woman with Margaret’s great love of expensive gifts, pageantry, and magnificent gowns, the preparations were a delightful diversion. She also enjoyed being queen of Scotland. Since she had to wait a year before going to Scotland, she was given her own establishments at Windsor and Westminster where she was served from golden plates engraved with the Scottish arms. Scores of footmen served her, dressed in the white and green Tudor livery while her litter bearers wore green and black. The litter which would carry her on progress north was itself a grand creation lined with blue velvet and cloth of gold; her state carriage was lined with bearskin, the horses hung with black and crimson velvet and her own saddle lavishly embroidered with red roses.